The classic, the not so troublesome, tasty French onion soup. I was going to make baked potato soup last night when I got home – ambitious of me, to bake 2 pounds of potatoes, then dice and mash them and cook them down into a soup. All this after a good, solid martial arts workout? I don’t think so, scooter. But I told 354 that I would cook supper for him, and like a good, trusting man, he didn’t eat anything so he could have supper when I got home (around 2100 zulu). What’s a girl to do? I suggested French onion soup, his eyes lit up and the deal was done. 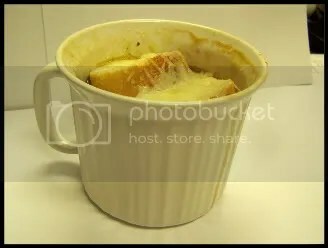 Had I ever made French onion soup before? No. (Had I ever eaten it? No.) Was I scared? No! I had recipes galore – Julia, BHG, Cooking, the entirety of the Internet at my fingertips! What was to be scared of? After two to three hours looking through recipes online and in-hand, I decided. Enough was enough. Enough of the recipes said onions, beef stock, butter, flour and a very, very small amount of sugar, and generally some dry white wine, so I figured it couldn’t be that hard to replicate. And on the whole, it wasn’t. There were pieces and parts of things that I will definitely do differently next time, but the soup itself, like soups should be, was simple. I don’t have a real technique for any of this – it was basically mix-and-match, so here’s what I did (and what I will do next time). I sliced three sweet onions in thin rings while my butter melted in the bottom of a saucepan. (Next time I’ll dice them for an easier time cooking them, and use a stockpot. I think I may mince some garlic to use as well.) I threw all my onions in the pan and let them soften and get golden in browned butter. When the onions were loose and browned, I put in more butter, then flour and the sugar and mixed it all up. (This is when you should add your wine, letting it cook down to reduce the alcohol content – I forgot in this batch of soup. Whoops.) When that had cooked down, I removed it from the heat and slowly added the beef stock, stirring well. I put it back on the heat and brought it slowly to a gentle boil, then partially covered it and let it cook down more, stirring occasionally. I seasoned only with salt and pepper to taste. 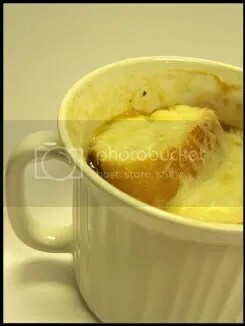 When I deemed it finished (maybe 20-30 minutes of reducing), I ladled the soup into ramekins, topped the soup with cheese, slices of baguette and more cheese. (I had a French baguette, and for this I would leave that the way it is, despite my love of seeded breads. I also used Gruyere and fresh Parm, but for an economy buy, use only a small amount of a more expensive cheese over shredded mozzarella, for taste.) Those went onto a sheet and under the broiler until the cheese and the bread was browned and bubbly (at least in the case of the cheese). This was what I got for my troubles: a rich, dark, fragrant soup full of soft onions the consistency of glass noodles, bread that had soaked up the broth on one side and was coated with melted cheese on the other, all melded together in a pot of deliciousness. The bread was quite possibly my favorite part – it was soft and juicy with the broth and the onions, but still crunchy from being toasted, with a good toothsome feel from the thick bottom crust. Not to say, of course, that the soup itself wasn’t delicious – I’m just a bread fiend. The broth had reduced around the onions and the hasty ‘roux’ created before adding the broth, but in this case, it was not something fabulous. It was, however, intensely satisfying. Comfort food to the utmost. Next time, like I said, I’ll dice the onions, add a few cloves of garlic, some dry white, maybe some white pepper toward the end. All in all, it was a successful venture. Don’t be afraid of the French onion beauty. Mix chicken with the beef if you like for a milder flavor; add a little red wine for a more robust kick. It’s a beautiful thing, and you won’t regret making it. Oh, and can I just tell you, real quick, how much I adore these 20 oz Corningware mugs? They have pop-on lids with a vent pop-up, and they will not leak. I swear, I took one of these with soup in it with me to work today. No leakage. These things are awesome; get some, if not something better. If there is anything better. End of my Corningware PSA. Thanks for reading! 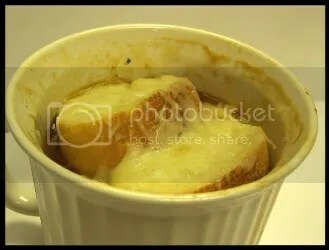 This entry was posted in Food and tagged Entree, French onion, Soup by Kate. Bookmark the permalink. Oh, that looks great! The last time I made french onion soup (about a month ago) I vowed that I would NEVER make it that way again. I’m more of a bread on the outside kinda girl though.